For other uses, see Veer (disambiguation). The Veer is an option running play often associated with option offenses in American football, made famous at the collegiate level by Bill Yeoman's Houston Cougars. It is currently run primarily on the high school level, with some usage at the collegiate and the professional level where the Veer's blocking scheme has been modified as part of the zone blocking system. The Veer is an effective ball control offense that can help minimize mismatches in a game for a team. However, it can lead to turnovers with pitches and handoff option reads. The Outside Veer (or "high dive") shown vs. an Oklahoma defense (3–4 or 5–2). The square indicates the dive read while the diamond indicates the pitch read. The Veer can be run out of any variety of formations, although it was primarily designed to be run out of the split-backed, aptly named veer formation. It has been used out of the I-formation (and its variants, including the Power-I and Maryland I) and the wishbone formation. Some variants of the triple option have now made the jump to the shotgun formation, which has become a popular option formation since Eric Crouch and the University of Nebraska Cornhuskers used the shotgun option during his 2001 Heisman campaign. 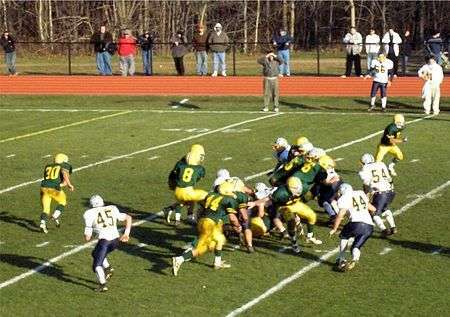 Morris Knolls High School of New Jersey running a typical veer play. In this picture, the quarterback, #8, is meeting his dive back. The other back, #30, is his pitch option. The Veer option is generally regarded as a "triple option". It is designed as a three-back attack with one player taking a dive course, one taking a pitch course and another being a lead blocker on the perimeter of the offensive formation. The QB makes reads on defensive players and then distributes the ball according to the defensive reaction to the offense. A typical play proceeds as follows (we will assume that this is an "outside veer" going to the right side out of the split-back formation): the quarterback takes the snap. He then does what is called "opening up": the quarterback goes from his two-point stance, facing forward, and takes (in this situation) his opposite side, left foot and pivots ninety degrees on his right foot, extending the ball toward the sideline he is facing. The split-back halfback on the right side, who in this situation is the "dive back", goes forward into the line to where the quarterback is and meets in an area called the "mesh point". This is where the idea of the Veer begins to take shape: the offensive line has left one man unblocked here, most likely a defensive tackle (although it can be a linebacker) or even a defensive end. This man is being Read by the QB. The defender is being forced to choose between tackling the dive back or the quarterback. The dive back explodes forward, puts his arms around the ball that is being extended, but does not take it. The quarterback, in his open stance, is reading the man being veered, in order to decide whether to "pull" the ball from the dive back and go through the hole, or to give the dive back the ball and have him go through the hole. This is where the name of the offense, the veer, comes from. This is just one part of the four-part option. If the quarterback keeps the ball, he attempts to cut up the field with the opposite side halfback, who has been running right towards the dive back's original position. He is the pitch man. He attempts to maintain proper pitch relation to the quarterback, technically a few yards outside the quarterback and moving laterally so that the quarterback may pitch the ball as he goes down the field. This entire action takes no longer than a few seconds. The fourth player in the split-veer would be a wide receiver or tight end. His job, depending on the formation, would be to block the force player who is responsible for the flat on the side being attacked. The offense relies on the quarterback making the proper reads, turning up the field (if he decides to keep the ball) and gaining yardage. The dive back must remember to not take the football from the quarterback, rather the quarterback must give it to him. The pitch man must maintain proper spacing from the quarterback to ensure that the quarterback can make an effective pitch that can ensure more yardage. The College Football Hall of Fame credits Bill Yeoman with the invention of the veer formation. Yeoman ran that offense with the Houston Cougars beginning in the mid-1960s and continuing through his career at Houston, which concluded in 1986. An example of an inside veer triple option. When an offensive system is devised for a team, the coach must take into account his players, so the veer can be applied to several situations. It can be used for undersized players so that double teams and angles can be used to block defenders. It can be used to isolate defenders and create predictable responses to the offenses actions. If a team is very disciplined it can take advantage of an undisciplined defense that can not execute their responsibilities precisely on each snap of the game. The veer requires precision, execution, and smarts. The ability of the QB to identify weakness in defensive alignment is paramount, as the veer can take quick advantage of a defensive misalignment. The veer also can be used with great effect when the offensive line is a strength of the team. Over time, the ability to pass out of the Veer has also been utilized depending on the quarterback's ability to "bounce" into a moving pocket to make short range passes. The most effective methods of passing out of the Veer also places emphasis on the interior linemen's ability to "sell" the defense on a run block scheme. Short yardage or goal line offensive situations are ideal for a Veer option pass play. The receivers that are the best options for a pass play out of the Veer are the first running back through the line who runs a "go" route isolating the frozen safety; the slot receiver who can release quickly from a block to run a skinny "go" route behind the cornerback or a tight end that can release out of his interior block and find an open seam underneath the lone safety. A third component to the Veer that comes with some passing success is the ability to run trick or gadget plays to take advantage of over anxious defensive backs and over pursuing linebackers. Once the ability to pass out of the Veer has proven successful, the countering of the Veer becomes more conventional and the safeties and cornerbacks must respect the pass first before attacking the line of scrimmage. The veer offense was adopted by Jack Lengyel, the new head coach of the Marshall University Thundering Herd prior to the start of the 1971 season after the 1970 team was killed in a plane crash. Lengyel believed that the veer option offense would be a better offense than the Power I offense he had used at the College of Wooster. Bobby Bowden, then the head coach of West Virginia, offered to tutor Lengyel and his coaches on the intricacies and nuances of the veer option offense. Lengyel installed Reggie Oliver at quarterback. The Young Thundering Herd of Marshall would win two games in 1971: a last-second win against Xavier in their first home game after the crash and the homecoming game against ranked Bowling Green. In the Florida State-Houston game in the Gator Bowl in 1968, the 'Noles brought the safeties up and they ignored the QB, running right past him at times, and crashed into the trailing back, usually Paul Gipson. This took the pitch option away. The Veer wasn't stopped but it was slowed. Florida State won the game 40–20. The most famous High School program to use the Veer is De La Salle High School in Concord, California. Head Coach Bob Ladouceur brought the offense to the school when he originally arrived to bring the infant program its first winning season. He put in the system because of the undersized players he had. After a record 151 game winning streak, his successor continues to use the offense today. Graduates of De La Salle who have gone to the NFL include Amani Toomer, and Maurice Jones-Drew. Another prolific high school program that runs the split back veer offense is John Curtis Christian School in River Ridge, Louisiana. The Patriots have run the veer since 1970, compiling a 431–36–6 record (through 2006) and winning 21 Louisiana State Championships under head coach J.T. Curtis. College Park High School in The Woodlands, Texas, which opened in 2005, runs the Veer Triple Option under Head Coach Richard Carson. The College Park Cavaliers who went 9–2 in only their second Varsity season in Class 5A in 2007, featured Josh Parsons at quarterback and Running Backs D'Jeale Lyons and David Crittenden in the Triple Option Offense. Notable Odessa Permian High School "Permian Panthers" of Odessa, Texas, a long time Wing-T offensive school, adapted to the Veer under Head Coach Scott Smith during the 2003–2004 seasons. They now are a spread option team. Another famous high school that runs the veer is Morris Knolls High School in Rockaway Township, NJ. Morris Knolls head coach Bill Regan has been running the system since 1975, and has won 4 New Jersey State Championships and 3 IAC and IHC conference championships. Many high school programs use the Veer for several reasons. Many times, the coach of the school played within the system. Other times, the same situation exists as above – lack of speed, size, and athleticism to compete with the teams in their league. However, the Veer has begun to fade as the spread offense and the run and shoot offense become more common and more advantageous. Other successful teams known to use the veer are the Kemmerer Rangers (Wyoming), which has won two state titles in the last three years; and the Baker County Wildcats (Florida) who went 10–2 and were 30th in the country. Thomas County Central High of Thomasville, Georgia, under head coach Ed Pilcher, won AAA state titles in 5 of 6 seasons (1992–94, 1996–97) during the decade of the 1990s running the veer. They were also state title runner-up in 2002, and reached the state semi-finals in 2003 and 2007. The Yellow Jackets went 15–0 in 1997, and finished 9th in the USA Today national poll. After the departure of Coach Ed Pilcher to region rival Bainbridge High School following the 2007 season, Thomas County Central High promoted long-time offensive coordinator Bill Shaver to the head coaching position, and the Yellow Jackets continue to use the Veer. As of 2012, the 'Jackets have been using the Veer as their basic offensive package for 22 seasons, while enjoying a streak of 22 straight playoff appearances since the implementation of the offense in 1991. Graduates of Thomas County Central who have gone on to the NFL include Joe Burns, Paul Miranda, and more recently, Dontavia Bogan. It is also noted that Coach Ed Pilcher then implemented the Veer at Bainbridge, but with far less success than what he achieved at Thomas Co. Central. He currently has a 28–26 record at Bainbridge, including a 1–4 record against his former team. Mount Carmel High School in Chicago, IL has used the veer option under Head Coach Frank Lenti since 1984. In that time Mount Carmel has won 9 state championships, and was crowned team of the decade in Illinois after winning 5 state titles in the 90's. Notable players that have gone on to the NFL include Donovan McNabb and Simeon Rice. Because more media attention exists on the collegiate level, the collegiate teams who have run the Veer and its variants are far better known. Beyond the Texas teams of the late 1960s and early 1970s, the most famous and well covered officially "Veer" team was the Houston squad led by Bill Yeoman. Yeoman's teams racked up thousands of yards on the ground, and won four conference championships and 11 bowl games. His teams finished in the top 10 four times. Other famous Veer teams include University of Nebraska, who won several national titles in their Power-I offense, and the United States Air Force Academy, NC State under Lou Holtz, and United States Naval Academy. The above-mentioned teams now run the official definition of a veer offense – that is, under center. Currently, the most successful team that runs the veer as their base offense is the United States Naval Academy, which runs the veer exclusively from the flexbone formation under Ken Niumatalolo, former assistant to Paul Johnson. Paul Johnson's version of the Veer has been quite successful, putting together substantial yardage totals against nearly every team encountering this offense. Critics of the offense often point out that bowl opponents have a 4-week time frame or longer to prepare for the offense, and this is a key factor in slowing it down. The zone read, or shotgun veer play, is now widely used throughout all levels of college football. A running back is lined up adjacent to the quarterback, and, at the snap, the quarterback opens up facing the running back. He reads the end on the same side as the running back. The running back is performing effectively the same motion as the dive back in a conventional veer, except he runs at the defensive end on the opposite side of the field. If the unblocked end on the running back's side (who, in a sense, is being veered) moves up the field towards the crossing running back, the quarterback pulls the ball from the running back and sprints by the end. If the veered end is waiting at his original position, the quarterback gives the ball to the running back. Many different formations are employed, and as a general rule, the option being employed is the base offense for the team, and not as a wrinkle. Look up veer in Wiktionary, the free dictionary.